A pair of small venues with inadequate facilities in Amsterdam joined forces with the National Music Information Centre and the Gaudeamus Foundation in a single music building at a fabulous waterside location along the IJ. 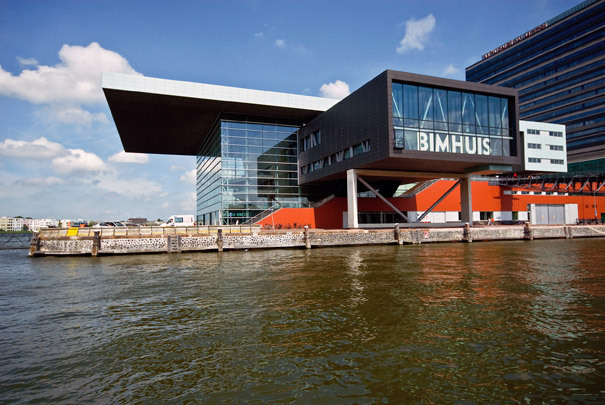 Its three components - concert hall, BIMhuis for jazz and improvisation, offices - are readily identifiable volumes stationed in and around a glass box. Dispatch bays and rehearsal and soloist's rooms assemble together in a plinth. For the rest, the design by the Danish architecture firm of 3xN is dominated by an expressive roof jutting a full 19 metres above the waterside terrace. The concert hall is a box-within-a-box to meet the acoustic requirements and its ceiling and floor can be moved to suit a whole range of performance criteria.